What Caused the Boston Massacre? 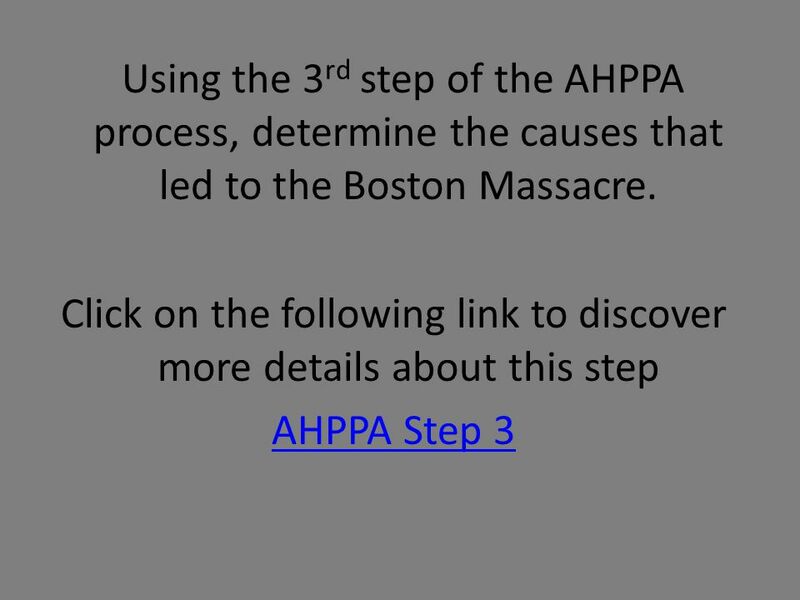 1 What Caused the Boston Massacre? 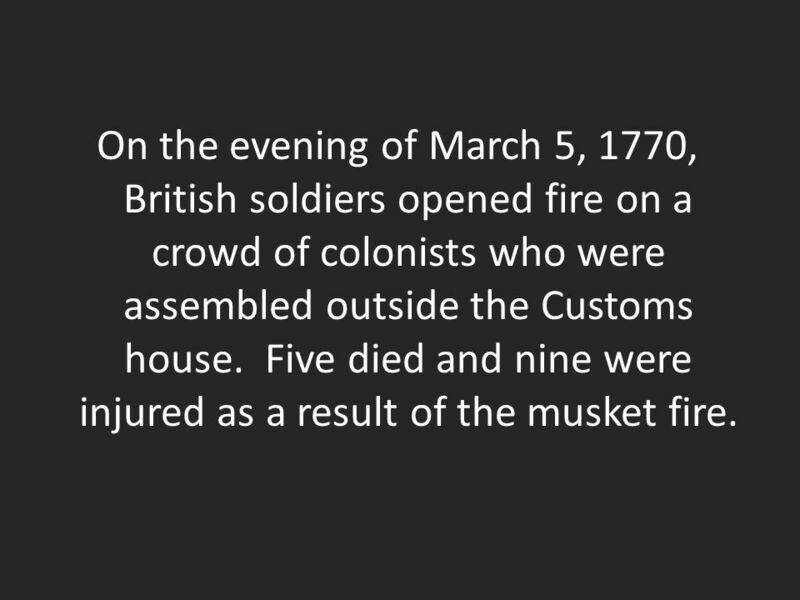 2 On the evening of March 5, 1770, British soldiers opened fire on a crowd of colonists who were assembled outside the Customs house. Five died and nine were injured as a result of the musket fire. 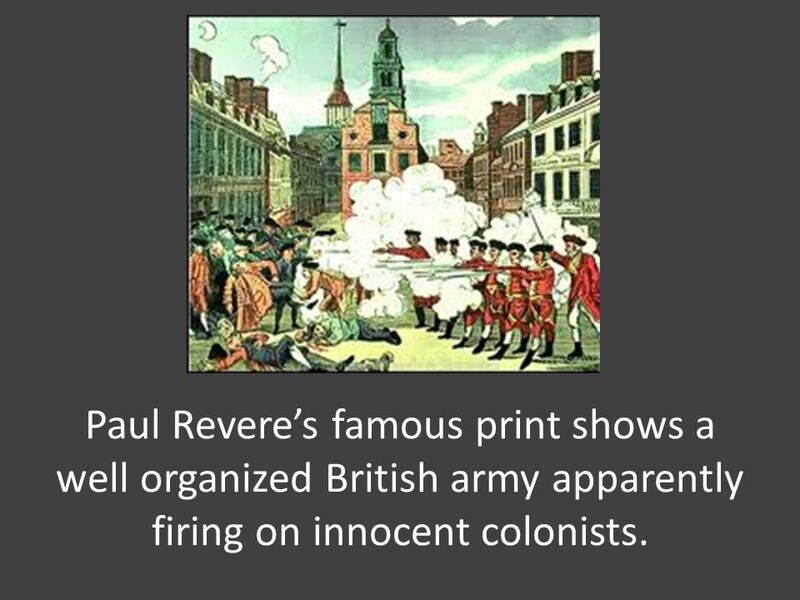 3 Paul Revere’s famous print shows a well organized British army apparently firing on innocent colonists. 4 Like any story, there is more to this event than is commonly revealed in history books. 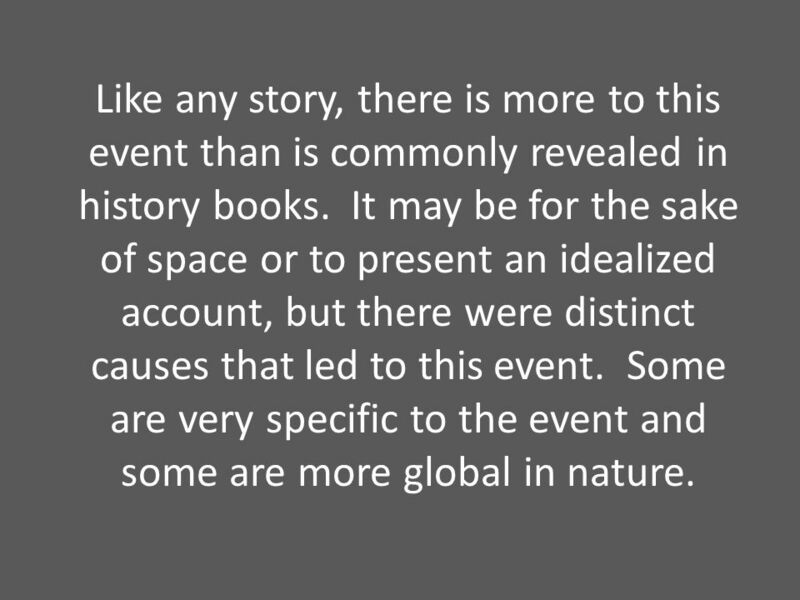 It may be for the sake of space or to present an idealized account, but there were distinct causes that led to this event. Some are very specific to the event and some are more global in nature. 6 As you research, create a chart with the following design to help you organize your information. 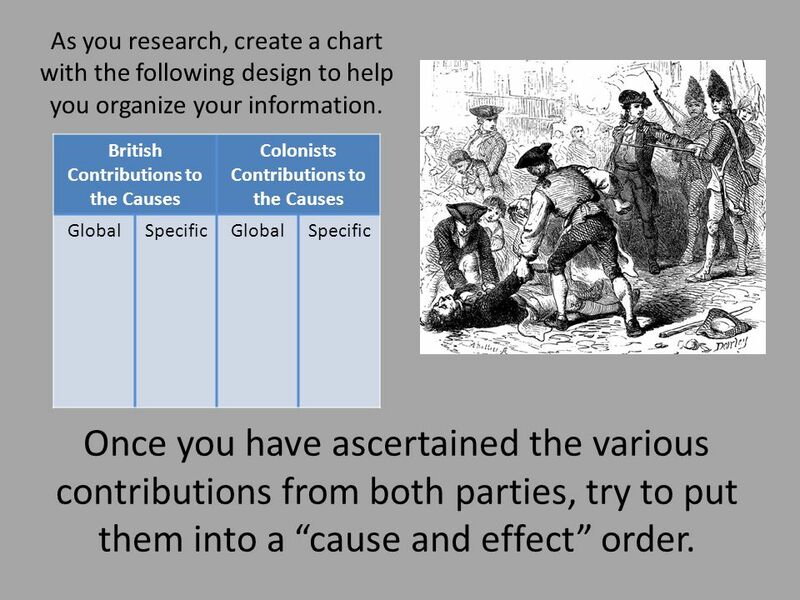 British Contributions to the Causes Colonists Contributions to the Causes Global Specific Once you have ascertained the various contributions from both parties, try to put them into a “cause and effect” order. 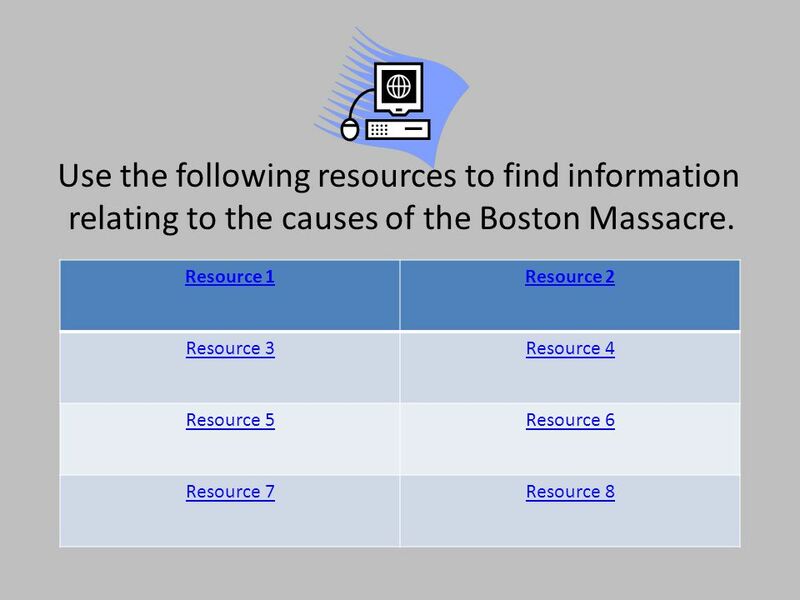 7 Use the following resources to find information relating to the causes of the Boston Massacre. 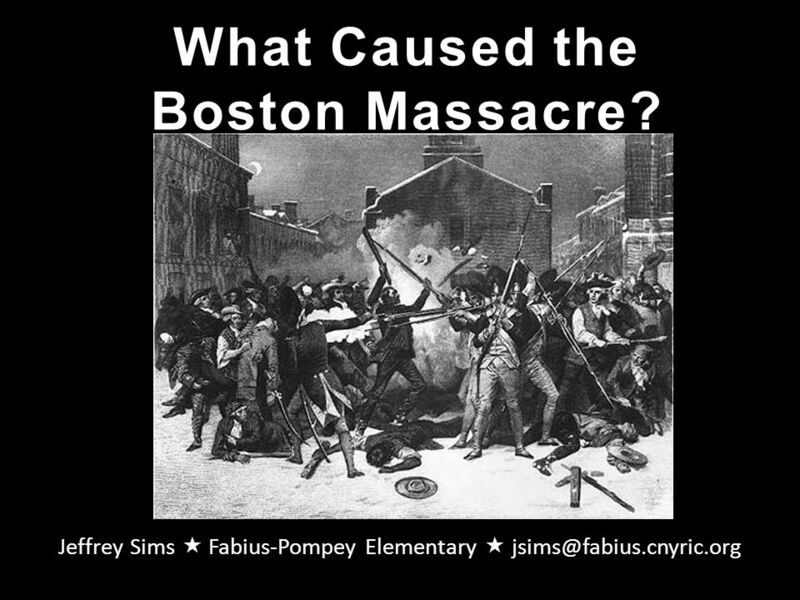 Download ppt "What Caused the Boston Massacre?" The Townshend Acts Indirect (not directly paid to customs agents, usually just result in higher prices) taxes on goods such as lead, paint, paper, and. Trouble in Boston British are nervous – Send two regiments of soldiers to set up camp in the middle of town. – Colonists felt that this was too much and. Learning Targets I can analyze the causes of the Revolutionary War. I can explain the causes of the French and Indian War. I can explain how the outcome. Proclamation of 1763 LAW passed by parliament forbidding colonists to settle WEST of the Appalachian Mountains. Chapter 7 The Beginnings of the American Revolution. American Revolution Ryan Videll 5 th Room 28. It’s Beginning The American Revolution is a very important part of our freedom. It was in 1774 In a place. Uniting the Colonists Coach Medford Building History Champions. In the Beginning  Taxation caused tension between the British and the colonists.  The colonists harassed the soldiers verbally and physically. Boston Massacre - Mr. Lundberg Group Members 1.. ____________________________ 2.. ____________________________ 3.. ____________________________ 4.. ____________________________. The Boston Massacre March 5, TII In the early spring of Late in the afternoon, on March 5, a crowd of jeering Bostonians slinging snowballs. Road to the American Revolution. French & Indian War War fought between England & France English & Colonists French & Indians vs English & Colonists WIN! !